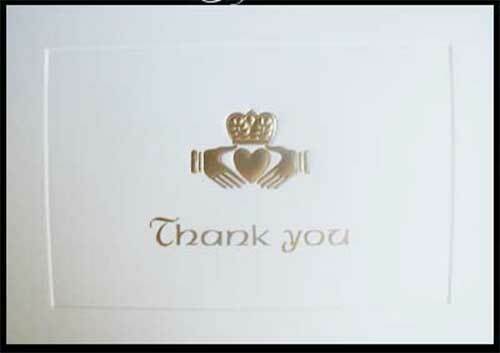 Irish thank you cards feature a gold foil Claddagh icon. 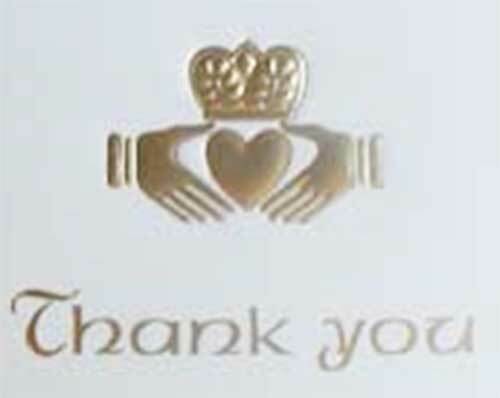 These Claddagh thank you cards are ideal for weddings. These Irish cards feature an embossed gold foil Claddagh along with the words thank you; they are blank inside for your personal message. The Claddagh thank you cards are made of heavy card stock and measure 5” wide x 3 1/2” tall; each box contains 10 beveled-edged cards and envelops. The Irish thank you cards are made in United States and included a Claddagh history card, complements of The Irish Gift House. Claddagh seals feature a gold on gold embossed design. Irish note cards feature a gold foil Claddagh symbol along with the words Friendship, Loyalty and Love.